Wilton Hunt Luxury Condos is a group of 20 cluster homes providing luxury living close to Wilton to the North and Westport to the South. Built in 1995 these 4 bedrooms, three and one half bath cluster colonials have 2,646 square feet of open and sunny space. In each of the Wilton Hunt Luxury Condos living areas you will find a family room with fireplace and nine foot ceilings, hardwood floors and large windows with views of the trees and woods outside. The kitchens in each home come equipped with a gourmet kitchen featuring stainless steel appliances, granite counter tops, easy to maintain hardwood floors, a skylight, and sliding doors to the deck. All condos are designed with an open floor plan and come with crown molding in the living areas, and nine foot ceilings. Storage will not be a problem in your fully finished basement with a sump pump for those rainy days. Wilton Hunt Luxury Condos will bring you to the town of Wilton, with numerous parks and trails, four movie screens, local grocery stores, specialty shops, and several restaurants. Just a few miles East of town you will find Westport, Norwalk, and the Long Island Sound. And to the South is Stamford with its mall and big box stores. Other condos in town to consider are Wilton Hills condos and Silvermine Wood condos. Recognized as a Parish in 1726, Wilton was granted incorporation in 1802. During the late 19th and early 20th century there were several manufacturing facilities along the Norwalk River. The last one, The Gilbert and Bennett Manufacturing Company closed in 1998. CNN Money voted Wilton one of the best places to live in the United States. While there is no town square, the feel of the town is of historic New England with its wonderful white spired church in town. 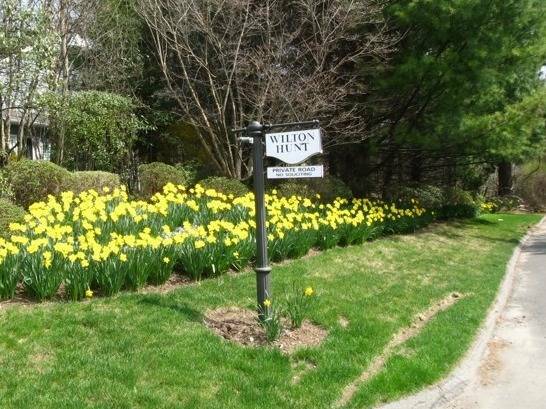 An excellent school system, an outstanding YMCA, and ease of travel to New York and other parts of Connecticut, make Wilton a great place to raise a family.